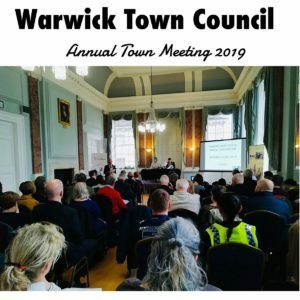 On 4th April, the annual Town Meeting took place in the Warwick Court House/Town Hall, when the Mayor reported on his year in office and representatives of the County, District and Town Councils reported on their work on current issues. The outgoing Mayor, Rich Eddy, noted the powerful community spirit in Warwick and praised all the volunteers who do so much work helping the most vulnerable in our society, and encouraging visitors to the town. There were also reports from school governors, various community organisations in Warwick, and organisations that had received council grants in the past year. After the formal presentations there was time for the representatives and members of the public to network with other organisations – an important part of the Warwick Town Meeting.